On November 10, 2018, Dr. Andu Dukpa, President of JNEC led a delegation comprised of the three Deans, Sr. ICT Officer and the College Football Team to the Indian Institute of Technology, Guwahati, Assam, India. 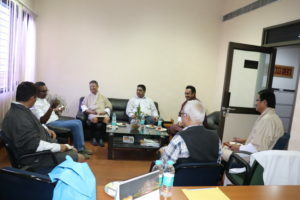 The delegation met Prof. (Dr.) Gautam Biswas, the Hon’ble Director of IIT and his team to discuss on the possibilities of engaging in formal collaboration in areas related to academic, research, faculty development & exchange, cultural exchange and sporting activities between the two institutions. The major focus was on matters related to the introduction of two new degree programmes in JNEC in 2019; i) Bachelor of Engineering in Mechanical Engineering (BEME) and ii) Bachelor of Engineering in Surveying & Geoinformatics (BESG). Prof. Biswas felicitated JNEC on the initiatives taken by the college to introduce such relevant programmes in the country and expressed IITs full support. He also cautioned that such new programmes should not cater to filling up the employment gap in the country but also its relevance globally. Engineering programme in JNEC. Earlier this year, Prof. Punekar was in JNEC campus to explore opportunities for further collaboration. IIT Guwahati and JNEC Dewathang have been looking into broader aspects of collaboration, including cultural and sports activities. Through this visit, JNEC hopes to build a stronger relationship with IIT Guwahati for mutual benefit. 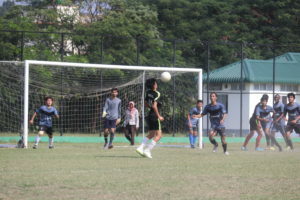 JNEC XI vs IIT Guwahati XI. served as a preparatory training session and exposure for Team JNEC as they are scheduled to leave for Bhutan University Sport Federation Games to be played in GCBS, Gedu from Dec 12 – 17, 2018. President, JNEC has already extended invitation to IIT to enable their sports and cultural troupe to travel to the campus and engage in activities that will help students from these two institutions to learn from each other and grow further, not just as professional but also as better citizens.